Famous people born on NOVEMBER 22 are known as the one who is likely to succeed. As a Scorpio, they are very serious when it comes to work. They make the most out of a bad situation and will make compromises to get the job done. They have good instincts as well. Mostly, everybody loves the personality of the famous November 22 celebrities. They have friends from all walks of life. Making and keeping friends come easily to them. When it comes to love, they like to be paired with someone much like themselves. However, they don’t like to be smothered. This could ruin an otherwise great relationship. As a career option, they have many to choose from starting with working with the public or for the public. Marketing is an open field and would suit the needs of famous people born on November 22. And this could be lucrative. Typically, they could find that it meets all their needs. They should be careful though not to spend more than they make. 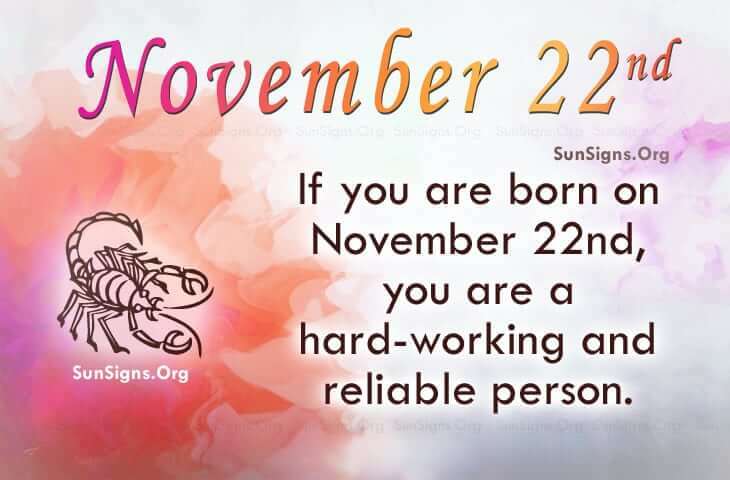 Famous people born on NOVEMBER 22nd are extremely hard-working Scorpios. They will be successful even if it kills them. As the “norm”, they feel responsible for their family. They may have a need to protect them. More so, they have a need to be free.